Prizes? Could someone describe ? I would have been happier to see this brawl if it had been announced before I used all my gold on packs yesterday. Here is a tip ladies and gents, play 2 dragon roars and high roll a Kalecgos , Nozari and Ysera , it worked quite well for my opponent. 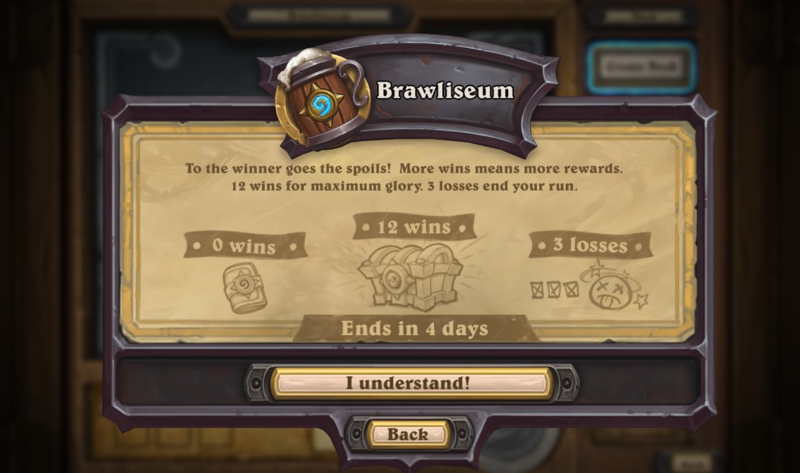 Okay here is a crazy idea to make this tavern brawl more enjoyable. Why don't you give access to all the cards so all players can participate? Although I have all the cards I need this is a great idea. Play more buddy, you'll get there. PSA: Put Archivist Elysiana, Harrison Jones and Acidic Swamp Ooze in your deck to screw with the bomb warriors and thief rogues. Look up budget decks. There are some very successful cheap decks to play. Lots of weeks they put people on equal footing in terms of collections. Sometimes the brawl favors a wider card pool. As long as they go back and forth I don’t see a problem. Do i get the retire reward when the brawl end ? There's a retire button which you can just use, but it's a bit hidden though. If I remember correctly you can access it by hovering over your deck's name.